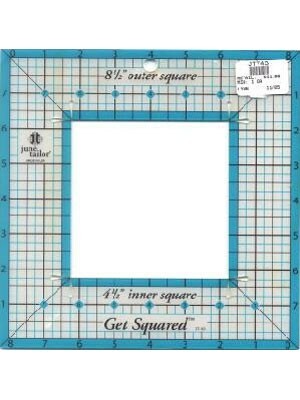 JUNE TAILOR - Get Squared QUILTING RULER Square up 2 sizes of quilt blocks with one ruler using just a Roatry cutter; no need to mark or trace. 1/4" seam allowance markings on all4 sides of exterior. 1/4" seam allowance marking on interior square. Teardrops allow for complete corner out of interior square. 3-colour grid markings for easy-to-read dimensions; Black = 1.5", Teal = 1/4", Magenta = 1/8". 45 degrees markings to visually square block designs. Use to fussy-cut large patterned fabrics.